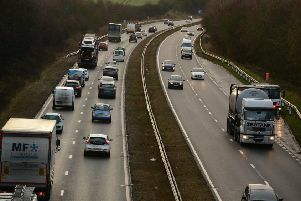 One lane is closed on the A1 northbound after a crash. All lanes on the A1 northbound near to the Angel of the North are now said to be open following an earlier crash. Highways England have confirmed that lanes on the A1 northbound between J65 at Blackfell and J66 at Eightonlodge have now reopened following an earlier incident. At around 6pm today Highways England said that Lane 3 of the road was closed near to the Angel of the North while emergency services were at the scene.